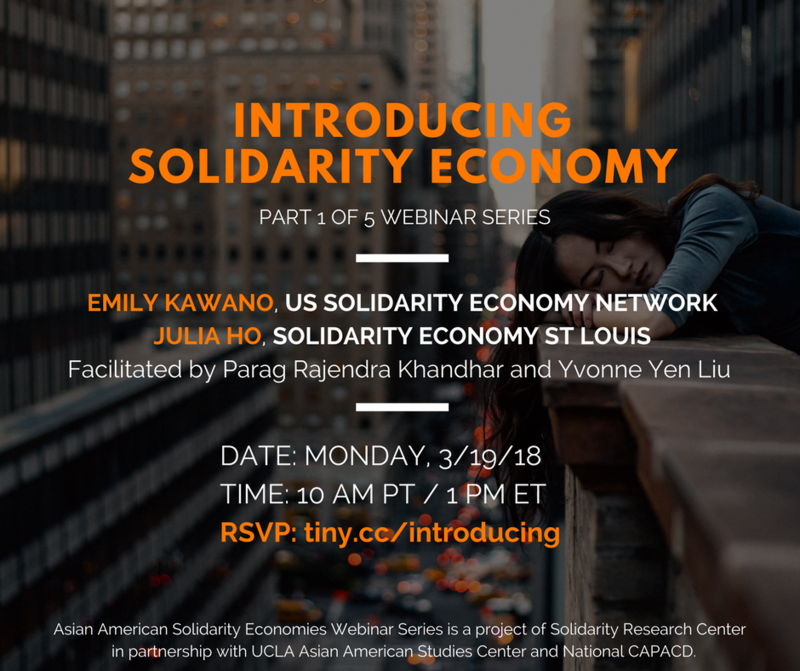 Our first of five part webinar series will present the framework of solidarity economics, its history and contemporary practice, and its examples in Asian American immigrant and refugee communities. Emily is the co-director of the Wellspring Cooperative Corporation which seeks to create an engine for new, community-based job creation in Springfield, MA. She serves as Coordinator of the United States Solidarity Economy Network. An economist by training, Emily served as the Director of the Center for Popular Economics from 2004 to 2013. Prior to that, Emily taught at Smith College. Julia is the founder of Solidarity Economy St. Louis. During the Ferguson uprising in August 2016, she worked with Missourians Organizing for Reform and Empowerment (MORE). For the past two and a half years, Julia has been building a network of businesses, organizations, and individuals fighting for a just and sustainable economy. Yvonne is the co-founder and research director of Solidarity Research Center, a worker self-directed nonprofit that advances solidarity economies. She serves on the board of the US Solidarity Economy Network and was named the 2018 Activist-in-Residence Fellow at the UCLA Asian American Studies Center. Parag is a founding principal of Gilmore Khandhar, LLC, a law firm focused on legal, policy, and advocacy tools to advance economic justice, racial equity, and social transformation. He teaches at George Washington University Law School. Parag co-founded Baltimore Activating Solidarity Economies (BASE) and the Asian American Solidarity Economies Network (AASE). Asian American Solidarity Economies is a project of Solidarity Research Center in partnership with UCLA Asian American Studies Center and National CAPACD.